The question I often pose to clients is whether they work with a “tax preparer” or a “tax advisor”. They are surprised by the question but equally surprised by the answer. A tax preparer simply collects tax information and enters the data into a software program. A tax advisor goes beyond these steps. 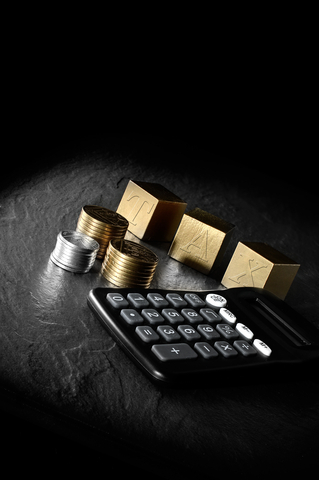 A tax advisor makes recommendations to reduce the tax bill using appropriate strategies. Because the Income Tax Act is complex, tax planning for farm families is especially important. Ryan Kitchen, a Chartered Accountant (CA) and partner of the Collins Barrow firm in Yorkton, Saskatchewan, provides income tax planning to individuals and corporations in the agricultural industry. Ryan has graciously agreed to share his publication, Tax Complications Upon the Death of A Farmer. Reading through his article clearly shows the importance of working with a tax advisor because of the many factors to consider. Additional farm-related publications may be found at Collins Barrow's website. Even though Canada does not have an inheritance tax, a significant and unexpected tax liability can be left behind by a farmer at death without proper planning and preparation. A deceased farmer is deemed to have disposed of all capital and depreciable property at its fair market value (FMV) immediately preceding death, with the beneficiary acquiring the property at the same value. Therefore, the FMV must be ascertained. The subsequent gain or loss is reported on the deceased’s final tax return and this value becomes the beneficiary’s cost basis going forward. However, under certain circumstances, the Income Tax Act provides an opportunity for farmers to perform a rollover of farm property on a tax-deferred basis when property is transferred to family members, thus avoiding the deemed disposition at FMV rules. Farm property may also be transferred on a tax-deferred basis to children and grandchildren upon death. In such cases, the farmer’s estate may elect to transfer the property at any value between its tax cost and its FMV. The election optimizes the use of available accumulated loss carryforwards, available lifetime capital gain deduction, or any personal exemptions. Shares in a farm corporation or an interest in a family farm partnership may also be transferred on a rollover basis to children to use any available lifetime capital gain deduction. If farm property is transferred to children prior to death under a purchase agreement and there is an amount still owing at the time of death, this debt may be forgiven without tax consequences if indicated as such in the deceased parent’s will. 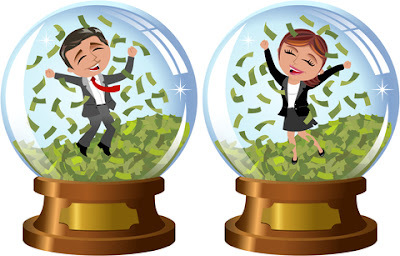 This strategy allows the parent to make the transfer today at FMV to trigger a capital gain, which is offset by the lifetime capital gain deduction. 3) A special election may be made to report this income on a separate rights or things return. This optional return could significantly reduce any tax burden as it gives rise to a second set of deductions and exemptions for the deceased, and could potentially reduce the deceased’s income to a lower tax bracket. This election must be made within one year of death or 90 days from the notice of assessment of the terminal return, whichever date is later. This election is an “all or nothing” reporting matter and, as such, it is critical for the personal representative to ensure all such rights or things are identified up front. 2) The eventual sale proceeds may be taxed in the estate’s tax return or in the beneficiary’s return when harvested and sold. Government contributions held in a farmer’s AgriInvest account are deemed to have been paid directly to the farmer immediately prior to death, unless they are transferred to a spouse or a spousal trust and vest within 36 months. Sometimes, it may be desirable to recognize the AgriInvest contributions as income on the terminal return rather than as a transfer. This would reduce the spouse’s or spousal trust’s income on later withdrawals from the account. Alternative minimum tax (AMT) often arises when farmers make use of their lifetime capital gains deduction on sales of qualifying farm property. However, AMT does not apply on any returns filed for the year of death. Previous AMT paid may be applied to reduce ordinary tax in excess of the AMT, which typically would be payable on the terminal return, but this reduction does not apply to rights or things returns. Mandatory and optional inventory adjustments added to income in the prior year are still deductible in the terminal return of the farmer. However, there are no provisions to apply the adjustments as income in the year of death. If the inventory was transferred to a beneficiary, a loss could potentially be created through the deduction of the prior year’s inventory adjustment, with no corresponding income to offset it. Ryan Kitchen, CA, is a farm program specialist in the Yorkton office of Collins Barrow. 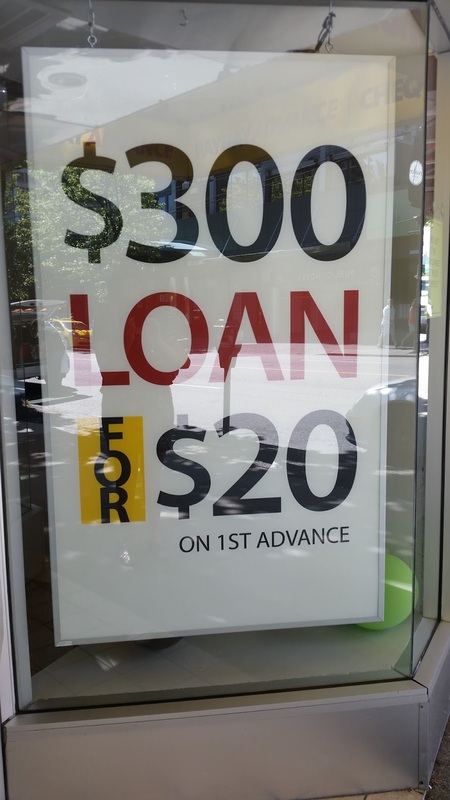 Anyone strolling down Robson Street in downtown Vancouver may disregard this type of sale advertisement unless you happen to be a financial planner or desperate for a cash advance. As a financial planner, I took note of this particular signage because my plans were to address this in a blog post. But I also remembered the first time I applied for credit. I made an application for a Sears credit card and was declined. I felt devastated and ashamed yet I trusted that the company’s reasoning must have been valid. The reason for the decline could have been missing or inadequate information and even lack of credit history. I didn’t understand and I didn’t ask. Now I will never know. When people are refused credit, they become desperate in times of distress. Payday Loans and Cash Advance stores are frequently being used by people who find themselves in these types of situations. They may not fully understand the fees and true cost of borrowing from these venues. At first glance these may sound like great deals but really aren’t. 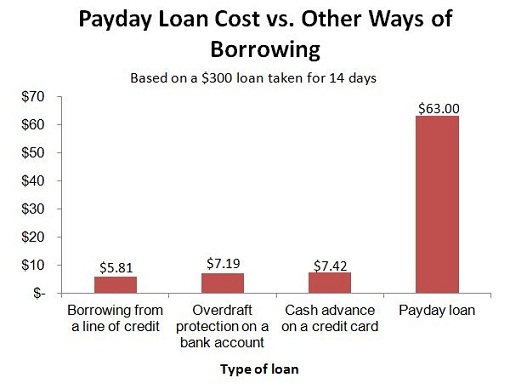 The Financial Consumer Agency of Canada (FCAC) provides a clear illustration of the cost involved with payday loan compared to other ways of borrowing. 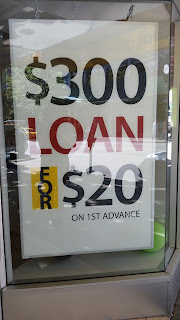 Undoubtedly, you can see the price difference you pay when you borrow $300 for 14 days. This information should convince anyone from using cash stores. It’s all in the math. a cash advance on a credit card includes a $5 fee plus 21% annual interest on the borrowed amount. 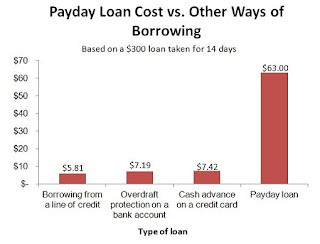 One cannot dispute the “good” about the payday loans. They are convenient, providing quick access to money within the hour. The advertisements proclaim “no credit check”. These are probably the only visible “good” things about payday loans. Behind the good is also the “bad”. Some people find themselves growing dependent on regular advances every payday. When a part of a paycheque is used to pay off your debt, a person will find themselves short of money for other expenses. Once again, they will be forced to apply for another advance. The endless cycle begins and develops into larger advances. The associated cost takes more from their paycheque than just repaying the borrowed principal. People depend on these types of loans because they may have been misled into believing their credit is poor. Although their credit is below the standard requirement, they may not have any direction how to fix their credit score. Any effort to improve a credit score in order to apply for a Line of Credit or Overdraft Protection at a bank or credit union will save money when borrowing is necessary. People have also felt intimidated by financial institutions because of what others have told them or even from their past experiences. Their fears may be unwarranted. Finding the courage to develop a relationship with someone at a bank or credit union where they feel comfortable will diminish their fears. In his book, The Success Principles, Jack Canfield emphasizes taking 100% responsibility for your life. Don’t be afraid to ask. Most people are afraid to ask for feedback about how they are doing because they are afraid of what they are going to hear. There is nothing to be afraid of. The truth is the truth. You are better off knowing the truth than not knowing it. And once you know, you can do something about it. The only way to wean oneself from using payday loans may be to find some way to earn extra cash. The purpose is to simply get ahead. If that means working an extra job for a short period of time, then do it. If it means borrowing money from friends and family with full intentions of paying them back, then do it. Doing nothing other than paying more money in fees than you borrowed does not make financial sense. Two other solutions also come to mind. First, learn how to prepare for an emergency. Second, apply the teaching by Bob Proctor who instills the message, You Were Born Rich. The answer might not be so simple but you must do something so that cash stores will not be the solution to put food on the table. If money is causing you stress, you’ll appreciate knowing you are not alone. 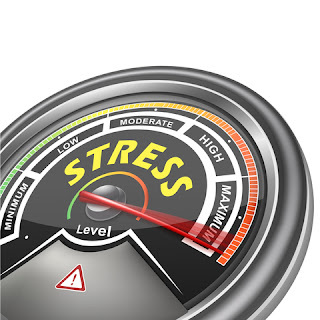 A national survey released by the Financial Planning Standards Council (FPSC) shows that 42 per cent of Canadians rank “money” as their greatest stress. The results are shown here. Living with feelings of anxiety and stress is not a prescription for a happy and content life. Yet how is it possible to achieve life goals without feeling stressed? In this survey Canadians with a comprehensive financial plan claimed success was possible more so than those without a plan. Your goals may not be outrageous. Like most Canadians you may dream about: taking the vacation you want every year, owning your own home, having sufficient discretionary income to lead the life you want, spending more time with family and friends, being able to undertake the activities you enjoy the most, and having enough money to pay for post-secondary education for your children. Talking about your personal goals with a CERTIFIED FINANCIAL PLANNER® professional is the first step to curing the ailments of “stress”. People often encounter financial roadblocks. I would like you to meet people you may recognize. You may have heard similar stories or lived through similar experiences. q Bob and Mary presently rent an apartment and want to own a home one day. Their incomes are relatively modest. Between their current living expenses and vehicle loan payments, they are uncertain whether they will ever own a home. q Randy has been talking about retirement ever since he was 55. However, he is feeling overwhelmed with the thought of giving up his current employment income. The uncertainty of having enough to meet his present lifestyle is playing havoc with his retirement decision. q Bills are coming from every direction. Having sufficient income to meet all these demands is causing Betty unbearable stress. When Betty thinks she has everything covered, an unforeseen financial emergency erupts: the car needs repairing, the washing machine goes on the fritz, and her dog needs vaccinations. q Gwyn and Roger would love to vacation annually with their two young children. With all the day-to-day living expenses and saving for their children’s education, their vacation dreams seem impossible. The above stories are about typical financial challenges. How do people overcome challenges to achieve positive outcomes? If they tried to do things their way and failed, maybe the next approach is asking for help? My intention for writing the blog, What Does a Financial Planner Do was to provide some insight as to how financial planners can provide assistance. Just like you would be reluctant to permit a surgeon to operate without the necessary qualifications, you would also be reluctant to take advice from a financial planner who lacks the necessary knowledge and expertise to deal with your money. This past week, a large number gathered in Vancouver for the 13th Annual Canadian Financial Planners Conference to learn from economists, tax experts, and estate lawyers. We learned about the mathematics behind annuities, cross border planning for Canadians and Americans, and managing market volatility. We also networked with fellow colleagues from across Canada to see what’s working for them so we can mirror their practices. As planners, we want you to see us as the experts who are willing to build a trusting and lasting relationship with you and walk you through your life challenges so you achieve your goals and relieve your stress. The decision is yours whether you are willing to enter into that relationship with us. With so many financial demands in your life, you naturally are apt to throw up your arms in frustration. “What’s the use? I can’t seem to get ahead.” Don’t give up too soon. Maybe there’s a solution you haven’t discovered to your financial circumstances. Your thoughts and ideas are the ingredients to create the wealth you dream of having. You will continue to receive the same results if you continue to stay focused on the things you do not have. “You were born rich” may be a difficult concept for people to believe simply because they look at their present world in disbelief and see only the impossible. 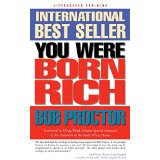 Bob Proctor wrote the book, You Were Born Rich, for people like you and I. The problem we have is in how we think. In this book, an encouraging message from Earl Nightingale makes us take note of our attitude. “Now, right here we come to a rather strange fact. We tend to minimize the things we can do, the goals we can reach, and yet, for some equally strange reason, we think others can do things that we cannot. I want you to know that that is not true. You do have deep reservoirs of talent and ability within you and you can have the things you want.” After reading this, I believe we hold back because we have reservations about our talents and abilities. Perhaps our talents and abilities have been buried for so long that we forget about them. That’s another hurdle to overcome. In 2009, I was looking for answers. I read this book because I was curious about the title. The truth is the book had an impact on my attitude. I started looking for talents and abilities buried deep within me then began the task of putting them to good use. During my meetings, I instill the same message to my clients, “You were born rich,” so they can begin cultivating a life of prosperity. The best gift I can give you is immediate access to Bob Proctors on-line book. Click here. The introduction provides the encouragement you need to start. Every human being has been “Born Rich;” it’s just that most people are temporarily a little short of money! This book has been written in an attempt to bridge the gap between where you currently are and where you want to be. Step by step, chapter by chapter, it will help you piece together the puzzle we most often refer to as “life,” so you can build a picture of prosperity in your mind, and then go on to create that prosperity in your life. Indeed, life is very much like the Rubic’s Cube because we have all the right pieces, and all the right colours, but it is a frustrating, never-ending process, trying to get them to fit together. Inevitably, it seems, there are always at least one or two pieces we have left out. Reading through the book will take some effort on your part. Work through the content slowly. I recommend finding a partner, someone who is as anxious as you are to experience a positive change in their life. Discuss the concepts. Dissect every chapter. Derive value from the messages. Above all, apply the lessons you learn to your life. You have everything to gain. This blog may sound like an advertisement. I am trying to sell you “something” - - something that doesn’t cost you anything except your time. The book ends with a powerful quote from Steve Bow. When you believe in yourself, you can accomplish mighty tasks. May the words, “Believe, Live, and Succeed” become your new mantra.